TALLADEGA – Grant Lynch, the jubilant, likeable and community-minded head of Talladega Superspeedway for the past 25 years, will have his swan song with the track’s recently announced Transformation – The Talladega Superspeedway Infield Project in the fall of 2019. Lynch, the Speedway Chairman who joined the staff at the 2.66-mile venue in January 1993, will retire after more than a quarter century of service to the track, the local community and the state of Alabama in November of next year – just weeks after the completion of Transformation. He came to the facility in its 25th year of operation and will be going out as it celebrates its Golden Anniversary. “Grant is one of the most spirited and beloved characters in our sport and has been a perfect fit to head Talladega Superspeedway for more than half of the track’s existence,” International Speedway Corporation Chief Executive Officer Lesa France Kennedy said in a news release. “He has always put his heart and soul into the success of the track, the sport of NASCAR, the local community and the state of Alabama. Transformation, an approximate $50 million redevelopment project, is part of International Speedway Corporation’s long-term capital allocation plan and reinvestment into its major motorsports complexes. The project is highlighted by a one-of-a-kind Garage Fan Zone Experience (140,000 square feet of social and engagement areas) that will feature “up-close” fan access to the drivers and teams, interactive attractions, a 35,000-square foot covered Open Air Club with 41-foot diagonal video screens, a new Gatorade Victory Lane, a Pit Road Paddock Club, and enhanced amenities in the infield. In addition, there will be more than 300 new RV spaces configured inside the track. “I have had a wonderful ride here at Talladega, and the time has gone by so fast,” Lynch said. “We have always tried to make this place the very best it can be for the fans, our local communities, and for everyone involved in the sport of NASCAR, as well as ARCA. We truly are a tourist destination for families everywhere to enjoy southern hospitality and racing at its best. Lynch has overseen many changes and updates to make Talladega the best track in NASCAR as well as the most fan-friendly. Items include the building of garages (1999) as well as the construction of new grandstands with comfortable fold-out chairs and video boards. Also during his tenure the track’s second major weekend was shifted from summer to the fall and the NASCAR Camping World Truck Series made its debut in 2006. There has also been the introduction of several fan-friendly premiums such as the “Big One on the Blvd.”, the traditional Saturday Night Infield Concert, Kids VIP, Military & First Responders and Teacher & Educator Appreciation. Lynch started as the track General Manager in 1993 and was promoted to Vice President of ISC and President of Talladega Superspeedway that November. In 1997, ISC also appointed him to oversee the construction and management of Kansas Speedway and in January 2000 he assumed additional operational responsibilities with Chicagoland Speedway. He was named ISC Senior Vice President of Business Operations in July 2007 and two years later became Chairman of Talladega Superspeedway. 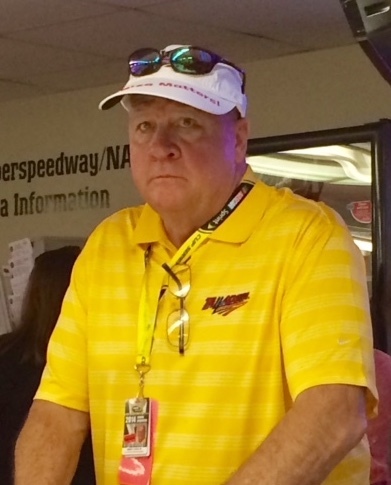 Lynch came to Talladega after 11 years with R.J. Reynolds Tobacco Co., where in his last post, he was Senior Manager of Operations and Public Relations, managing the company’s involvement in NASCAR Winston Cup Series. His career there spanned back to 1982 when he joined RJR Special Events as a Camel GT Series show car driver. In related news, the track said Wednesday it would open portions of its campgrounds free to evacuees from Hurricane Florence seeking temporary refuge beginning Sept. 13 at 9 a.m. The track is opening is Winner’s Walk I reserved RB area outside Turn 1. Directional signage will be posted at the main entrance to the track with additional signage displayed for easy access to campground.